A few weeks ago we posted our review of the GAN 356 Air Master, kindly written by Niko Azerty of Puzzling in Wonderlands. Before that, I had already reviewed the same back in my old blog. What makes the Air Ultimate different? Well, you may have noticed that, for one, it has a steeper price. However, cost is far from the only difference - there is quite a lot that distinguishes this cube from its cheaper brother. 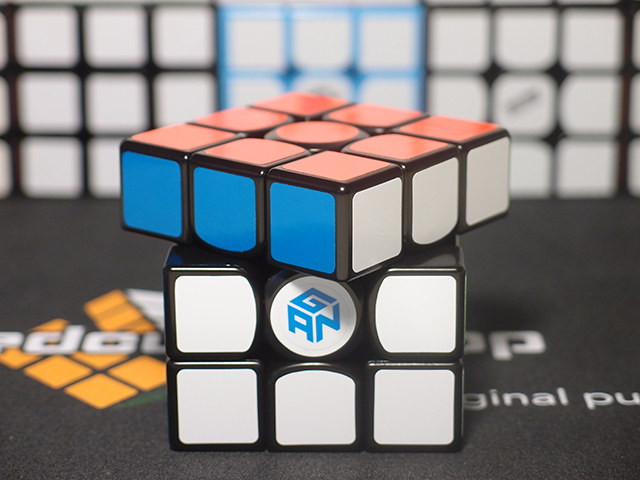 The GAN 356 Air has been released for some time now, and by all accounts it is an excellent cube. 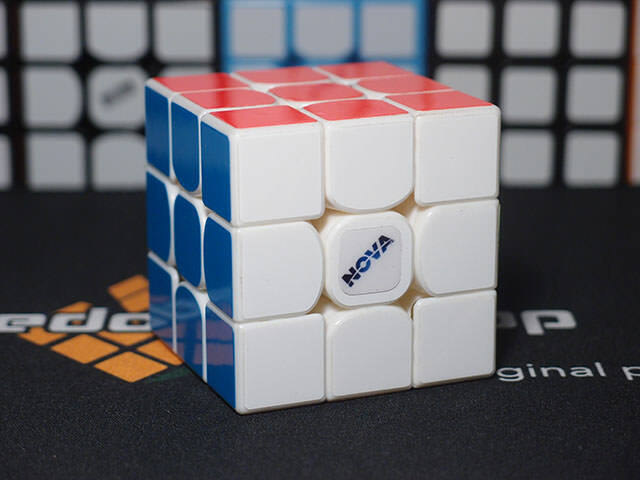 It turns extremely smoothly with almost infinitely adjustable speed, corner cuts well, doesn't pop, and offers a novel easily-interchangeable spring system not seen by any other cube. Just like its predecessors, it also carried quite a hefty price for a cube. Anyone would think it was destined to be a flagship, sitting at the top of a product lineup, right? Apparently not GAN. A few months later, they released this cube as its new flagship, at an even steeper price. In essence, this cube was extremely closely modeled after the 356 Air, but it actually has a bit less plastic for reduced weight as well as a different plastic blend for supposedly smoother turning (we'll see about that), and the cube comes hand set up from the factory. Being GAN's flagship, this cube has no holds barred in terms of included accessories. 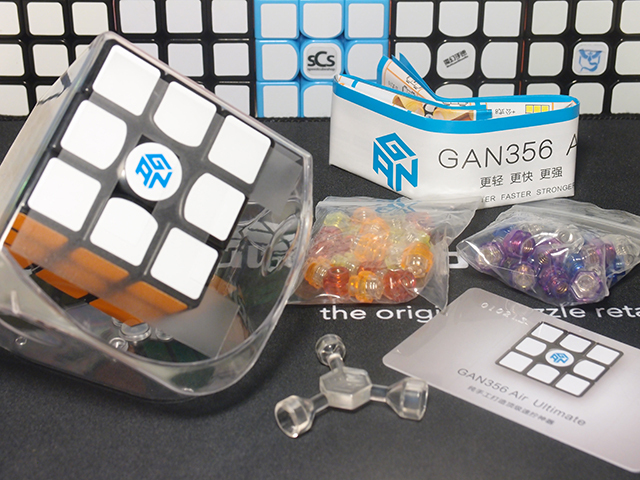 It comes in the typical GAN clear plastic box with a pamphlet, but also includes a tensioning tool, a bag of S-series nuts, and a bag of G series nuts, and the limited edition GAN Ultimate card, to prove your ownership of one of the highest end cubes in the world. Well...it's a GAN Air variant. What can you expect? 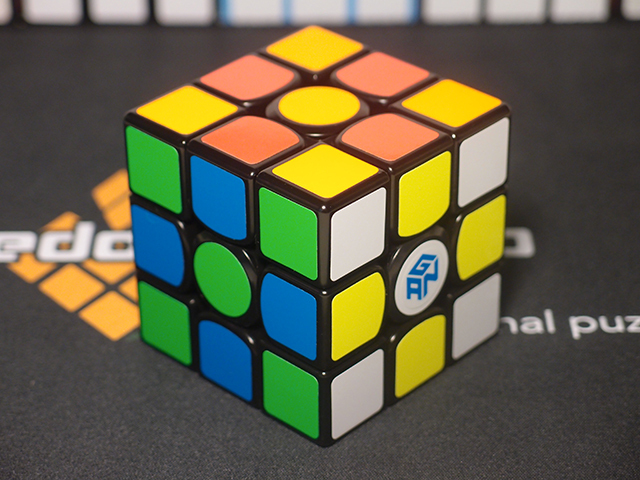 Externally, it looks indistinguishable from a standard black GAN Air, retaining the same squared corners, circular center, and even sticker template. On that note, the only external difference out of the box is the use of GAN' version of full bright, which is as follows: White, Fluoro Yellow, Fluoro Red, Fluoro Orange, Fluoro Green, Sky Blue. It's not a bad color scheme. Due to various internal modifications GAN has made, it actually weighs less than a standard Air, coming in at 68 grams stickered to the typical Air's 74. 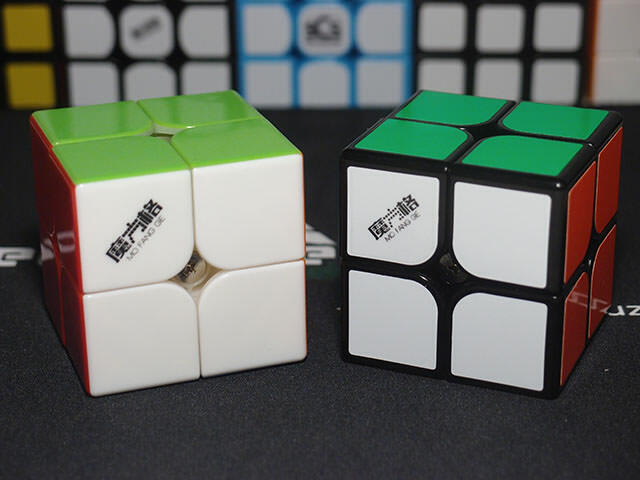 This doesn't affect the build quality at all: despite being a similar weight to the papery feeling GuanLong, this cube still feels very solid, with zero creaking or loose pieces. For some inane reason GAN has chosen to make the Ultimate version only available in black. Surely more choice is better? No setup here. Not even because it just performs well, but instead because it's hand set up at the factory and carries a price to match, so wouldn't you expect it to be perfect out of the box? I know my Cosmic Valk 3 was, and that one was cheaper than this GAN. Oooh...quite nice. I never really liked the base Air, finding it too uncontrollable and catchy, and not flowy at all. I suspect this could be down to a setup issue, but if it is I can't resolve it. This cube, on the other hand, turns a bit slower but much more controllably, and flows easily and smoothly in algs. Stability is just a tad decreased but not enough that it becomes an issue, and it does help with corner cutting and flow. Turning is a tiny bit lighter, as you would expect, due to the decreased weight. Interestingly enough, despite GAN' claims about their new plastic, I found the Air U to be less smooth and more tactile than the standard Air - almost like a Valk. It's not a change for everyone, but it certainly is a welcome one in my eyes. I was a tad disappointed here. The GAN Air U does manage full cutting like its other high end competitors, but unfortunately corner cutting begins to feel stiff beyond just 30 degrees. 45 degrees is practically impossible to cut with the force that I typically exert during solves. In comparison, I can use a solve-typical force to cut 48 degrees on my Cosmic Valk. I'm not going to mark off too much for this, since it does manage full cutting and I'm pretty sure the stiff cutting can be alleviated with setup anyways. Reverse cutting, on the other hand, is beautiful. 38 degrees and all of it with minimal effort. In fact, it takes less force to reverse cut 38 than it does to forward cut 45. Having already been over GAN Air internals in my old review, I'll primarily be discussing the differences here. Rather interestingly, GAN decided to go with the green spring as stock, which is not a spring you see used very often. Can't argue with the results, though. The edge and corner piece. 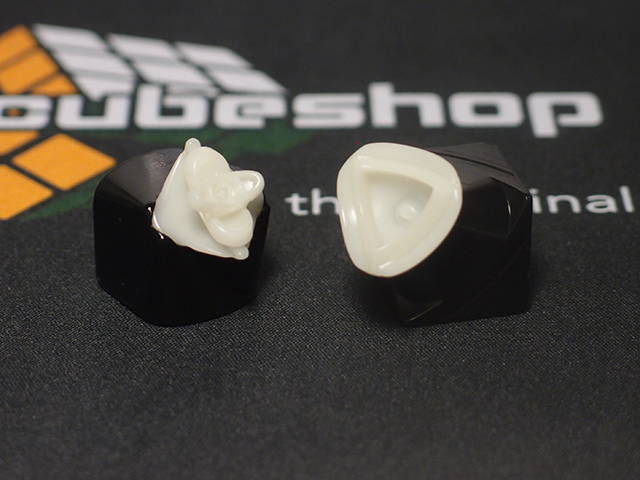 They look more or less identical to the standard Air's pieces, with one important difference: the screw is missing! Instead, GAN has decided to bind the pieces with a (lighter) nylon bolt before gluing everything together. In fact, if you look at the concept pictures there's actually extra plastic removed as a further weight savings, since it was no longer needed with the removal of the screw. DO NOT try to take apart the pieces with the expectation that you'll glue them together later. The pieces are glued with Tamiya Extra-Thin Cement, which works by chemically welding plastic surfaces together. Your attempt to open them may result in a clean break along the glue line, but it just as easily may result in a cracked piece. Yes, the feet do glow, not that I could get a picture. I still don't see the point, but at the same time I can't imagine it was done on accident. I have to judge this cube's value a bit differently from every other cube out there. 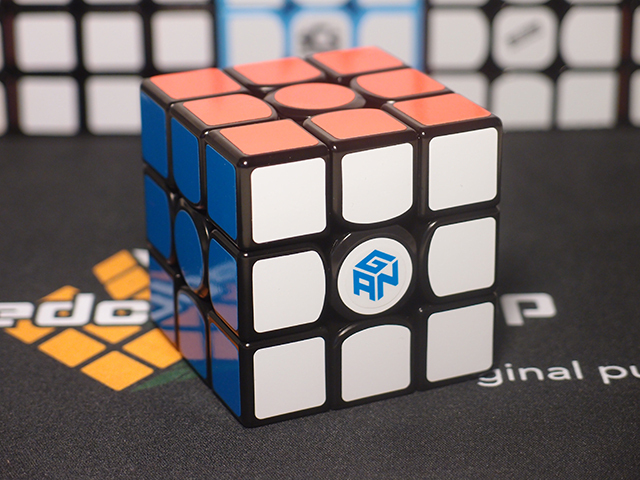 GAN didn't make the cube with the expectation that half of the cubers at a competition would main it; they made it as an ultra-high end product to represent the best of what their company can do. It's just like how Nissan makes the GTR when most of its cars sold may be in the Altima range. Not being a cube designed for value, I don't think it's quite fair to judge it on a typical value scale. So with that in mind, I actually think $39.95 is actually reasonable for this cube. However, when you factor in the competition, the scene becomes more interesting. Many of the Cosmic flagships come in at around the same or even less amounts of money, and the one Cosmic I have, the Cosmic Valk, is the best 3x3 I have ever owned, this cube included. This cube does come close, I'll give it that much. Some people may even find it better. However, I just see it as another competitor to the Cosmic-range cubes, so in the end considering its high price it's not a terrific value in that regard. In particular, the Cosmic Air is actually an identical price to the Air Ultimate. Sure, you don't get the lighter weight or supposedly new blend of plastic, but given the care SpeedCubeShop puts into setting up its cubes I feel that the setup may feel better to many. Generally I have no issue with limited edition cubes, since most limited cubes are just existing cubes cast in a new color. I think those are worthwhile for collectors but offer no real extra value to a pure speedsolver, so speedsolvers wouldn't need or want it. 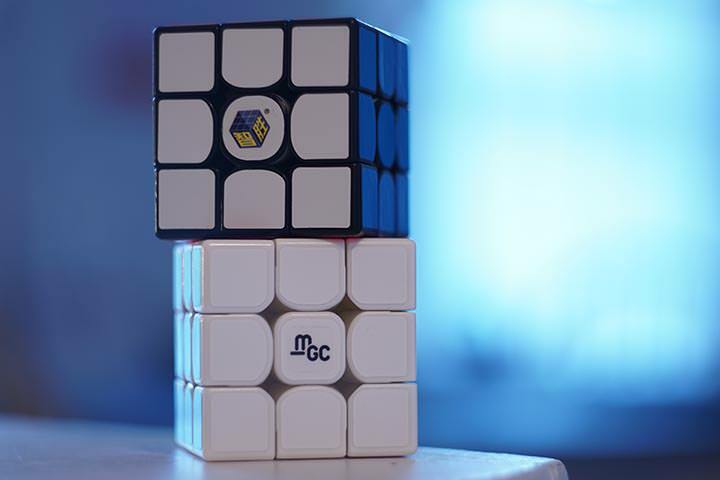 The problem comes when you actually make a physically new cube with a new mold, as GAN has done, and limit the release of that cube. If there's any physical benefit, it's not right that anybody who comes late to the party would not be able to enjoy it. This cube is nearly perfect in pretty much every aspect, from its weight and durability to its flowiness to its perfect reverse cutting and anti-pop that I don't even need to mention. The fact that it's a flagship with a truly flagship price should only contribute to this cube's unique identity on the market. There's nothing wrong with this cube in my eyes. I love the way it feels in the hand, the turning, the flowiness, and especially the hint of tactility. It doesn't quite beat out my Cosmic Valk, but that doesn't mean I find any issue with it either. 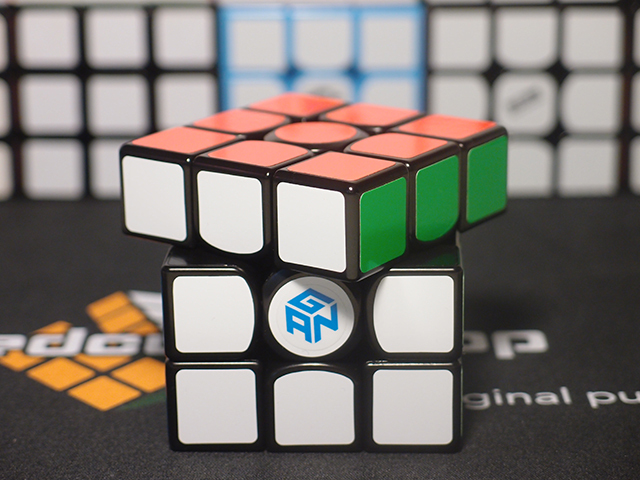 This cube is one way the full potential of the GAN 356 Air can be achieved. 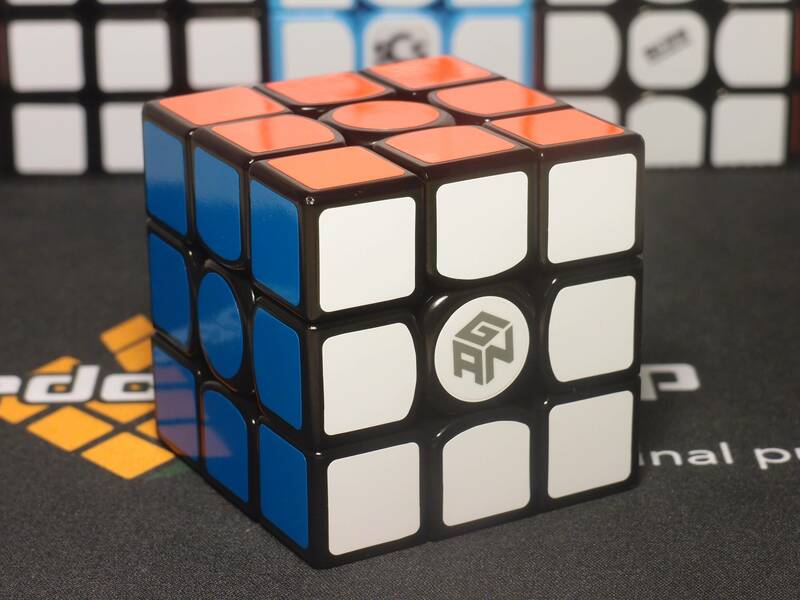 Its unfortunately high price and limited availability mean most cubers may never have the opportunity to own one, but for those who do and those who need it, the GAN Air Ultimate is as good as cubes get. Hey Karl love the reviews as always but I think you should get your blog in a bigger font or on the front page and big since it might be hard to find and calling it a blog might be slightly misleading.